Be the first to share your favorite memory, photo or story of Cletis. This memorial page is dedicated for family, friends and future generations to celebrate the life of their loved one. 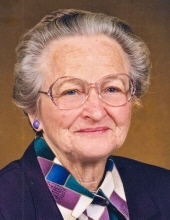 Cletis Dee Snyder, 91, of Pleasant Hill, was born, July 14, 1927, on a farm southeast of Latour, the daughter of John W. and Vangy (Shelten) Murphy. She departed this life, Wednesday, August 8, 2018, at the Foxwood Springs Rehabilitation Center in Raymore, Missouri. Cletis was a 1944 Latour High School Graduate. On July 23, 1948, she was united in marriage to Bill J. Snyder in Kansas City. He preceded her in death on August 4, 2011. Cletis was also preceded in death by one son, Larry Snyder on May 21, 2016; a grandson, Christopher Snyder; one brother, Jimmy Murphy; and one sister, Freda Shipley. She is survived by three children, Billy (and Sherrie) Snyder, Dennis (and Melinda) Snyder, and Darlene (and Clifford) Eslick, all of Pleasant Hill; 9 grandchildren; 14 great grandchildren; one brother, Bill (and Bonnie) Murphy of Kingsville; two sisters, Stella Whiteman of Kingsville, and Mary McKay of Holden; and many other relatives and friends. Cletis was a homemaker and enjoyed working alongside Bill on their family farm of 67 years. Prior to her marriage she had been employed as a waitress in Holden (where she first met Bill), and also at Sears & Roebuck in Kansas City. She enjoyed spending time with family, sewing, quilting, crocheting, painting and watching the Royals. She was an active member of the East Lynne Baptist Church. Visitation was held Sunday, August 12, 2018, at the Stanley-Dickey Funeral Home. Funeral services were held Monday, August 13, 2018, at the funeral home. Reverend Matt Peery will officiate. Interment will be in the Staley-Mound Cemetery. Casket bearers are Clint Eslick, Justin Eslick, B.J. Snyder, Chase Snyder, Matt Snyder, and Tim Taylor. Honorary casket bearers are Max Schmoll and Don Sousley. Memorial contributions are suggested to the Staley-Mound Cemetery and may be sent in care of the funeral home. To plant a tree in memory of Cletis D. (Murphy) Snyder, please visit our Tribute Store. "Email Address" would like to share the life celebration of Cletis D. (Murphy) Snyder. Click on the "link" to go to share a favorite memory or leave a condolence message for the family.